Fishing forum > Search: > My first sturgeon!! Author Topic: My first sturgeon!! Hey guys,. I haven't been on in a while, although I have been fishing. And recently I caught the fish of a lifetime from shore. 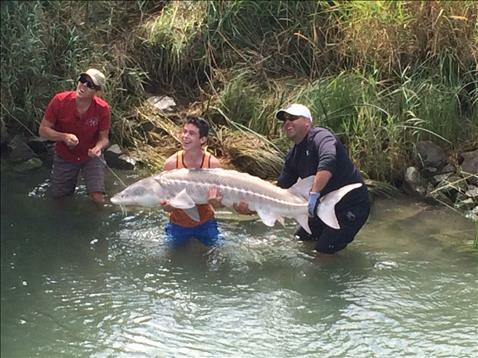 Here she is, a big beautiful white sturgeon! well done. next time keep it in the water for your picture. there are some guidelines somewhere about handling sturgeon. someone will likely direct you to those guidelines . 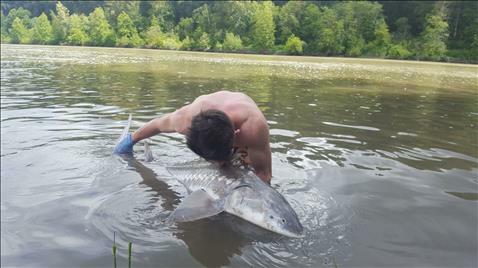 Try googling "angling guidelines for White Sturgeon". The guidelines outline safe methods for catching and safely releasing the wonderful beasts! As you know, catching a wonderful fish like the one you did is an experience of a lifetime. I caught one 5/1/2 feet last fall (with a guide,unlike yourself) and it was a highlight of my life. Let's make sure they all survive so they are there to be caught again. Congrads again on the fish. Sorry i was unaware of the procedures at the time, with my more recent catches i have been much more careful with these beautiful creatures!! And i have evidence!